Well, dear readers, we have most certainly not lost that lovin' feeling...check out today's deal-io...this makes two in the last few days, right? 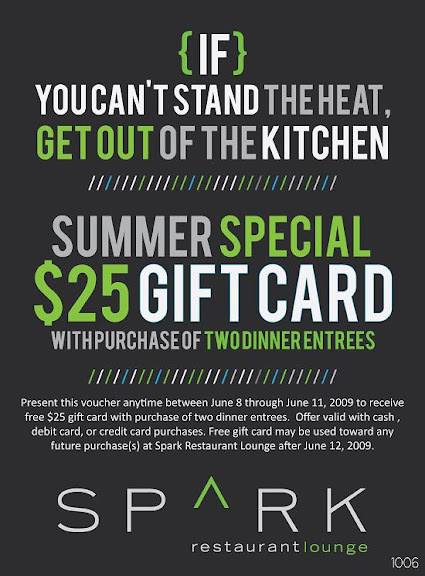 I have to say I appreciate the price point on this deal--every.single.local can take advantage of this generous offer at the new Spark Restaurant + Lounge without breaking the bank. Print it out for you, print it out for the couple you're doubling with, and print it out for your little brother. I strongly recommend making reservations in advance to avoid a long wait. 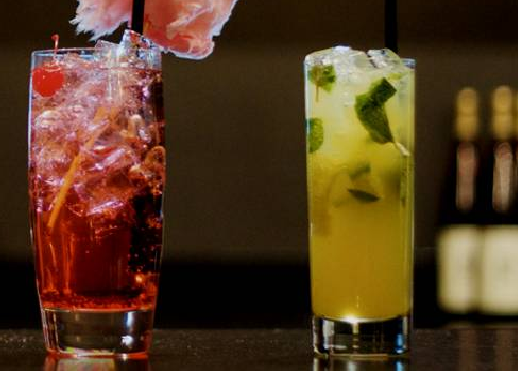 This restaurant is scrumptious and their innovative "mocktails" are out-of-this-world! Let it be known the interior exudes a distinct urban feel you won't find elsewhere in town. If you're looking for a little direction in the drink department, try the "mango mojito", "lycheetini" and the "kiwi martini". All 3 are outstanding choices so drink up! Given the non-alchoholic status you can drink as many as you'd like without thinking twice. This is also the place to enjoy exotic, imported sodas from Japan, Brazil, and elsewhere. It was fun to see you there, Stephanie! I wish we could have chatted a bit more.